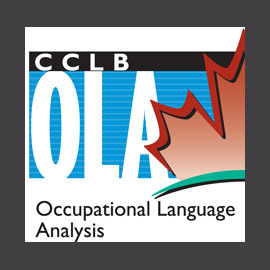 Supports Canadian Language Benchmarks specialists to develop occupation-specific language training curriculum, course materials and/or assessment tools. Helps sector councils, industry organizations, and workplaces to define occupational language requirements and to provide appropriate language training or development opportunities. Provides ESL/FLS and Essential Skills teaching aids for those working with adult immigrants and newcomers. The bridging materials support the use of the Canadian Language Benchmarks and Essential Skills. Describes the second language proficiency of people and their ability to communicate effectively in the workplace and community. They describe language proficiency in the areas of speaking, listening, reading and writing. Are enabling skills, for example, reading and oral communication skills, which help people participate fully in the workplace and community. Seven of the 9 Essential Skills have a scale to describe levels of task complexity. Essential Skills Profiles describe how specific skills are used in a given occupation. Through extensive research, the Government of Canada and other national and international agencies have identified and validated nine Essential Skills. These skills are used in nearly every occupation and throughout daily life in different ways and at different levels of complexity. Essential Skills profiles describe how each of the nine Essential Skills are used by workers in a particular occupation. Over the past several years, the federal department of Human Resources and Skills Development Canada has conducted research examining the skills people use at work. From this research and through interviews with workers, managers, practitioners and leading researchers, over 350 Essential Skills Profiles have been developed for various occupations of the National Occupational Classification (NOC). You can find more information about Essential Skills by clicking the links on the right. The Centre for Canadian Language Benchmarks’ conducted several research and development projects in order to bridge two national skills standards. Bridging these two standards supports a better understanding of the skills newcomers and immigrants need to reach their employment goals. 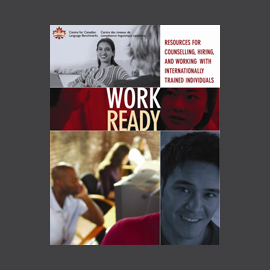 For internationally-educated workers, it helps them access Essential Skills resources to better understand job specific competencies and requirements and understand the language proficiency necessary to meet those requirements. For ESL/FLS professionals, it helps them use the Essential Skills resources to better understand job specific competencies and tasks, and develop more targeted workplace related language training programs. 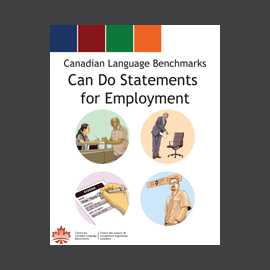 For workplace trainers and career counsellors, it helps them use the Canadian Language Benchmarks to understand language skills necessary to perform tasks related to specific job competencies, and develop appropriate workplace training and development programs. 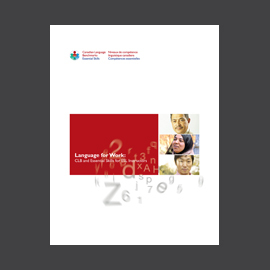 For employers, government and sector councils, it helps them identify better and understand the language skills required for success in the workplace. tools and resources to support their use in the language training community and the labour market. This project resulted in the development of this website to provide second language trainers and practitioners with online access to existing Essential Skills resources for use in the classroom and for materials development. The project also resulted in Comparative Framework comparing the two national skills standards, sample tasks, and information on how to integrate Essential Skills into the ESL/FLS classroom. A national advisory committee made up of experts in CLB, Essential Skills and workplace training provided national support and direction to the project management team over the 3 years. Click this link to see the members of the National Advisory Committee: ESnac. This project resulted in the development of a methodology for benchmarking the language skills of select tourism sector occupations, based on Essential Skills Profiles and National Occupational Standards. Applying the methodology to specific occupations resulted in the development of a number of Occupational Language Analysis documents for occupations within the Tourism sector. This methodology provides the basis for benchmarking other occupations and sectors. The project goal is to develop a series of guidebooks in order to increase the capacity of a range of stakeholders to better support immigrant clients seeking to develop their Essential Skills. 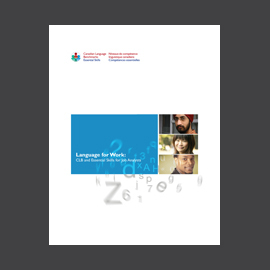 The guidebooks include an introduction to the Essential Skills and Canadian Language Benchmarks as the national frameworks underlying workforce related training and learning programs, providing targeted stakeholder groups with guidelines, best practices and other tools in order to better understand and serve the needs of immigrants. Guide for Job Analysts: This guidebook contains tips and checklists for Job Analysts who develop Essential Skills Profiles and National Occupational Standards. Guide for Trainers: This guidebook is for trainers in a variety of environments (corporate, literacy, unions, etc). It explains how to incorporate Essential Skills into training plans and needs analyses, including plans for second language literacy. Guide for Instructors: This guidebook includes resources for ESL/FSL practitioners with tips and ideas on how to build Essential Skills for a generic audience with lower level language proficiency. Tools include an Essential Skills Primer with a diagnostic component and twenty-five lesson plans for CLB 1 – 7. This tool was designed to be used for CLB levels that fall below those corresponding to the ES levels in the Comparative Framework. The Essential Skills Primer: CLB Stage 1 has two important characteristics: a focus on lower CLB levels and an emphasis on workplace-related tasks. It consists of a diagnostic tool and a set of skills tables. The Essential Skills Primer: CLB Stage I is an excellent tool for ESL teachers who want help diagnosing the Essential Skills needs of their language learners and who want task descriptors that can be used to incorporate Essential Skills into ESL classroom activities. It was designed for use with learners in the CLB 1 – 7 range and covers four communication skills. Use this tool to help beginner and intermediate-level learners work towards their Essential Skills competencies in Essential Skills complexity level 1. This document, often referred to as the “Comparative Framework”, contains a complete list of global descriptors and tasks for corresponding CLB and ES levels and skills. For each skill, a chart is first presented in order to provide a quick overview of the general relationship between the two scales (Global Descriptors). This initial chart is then followed by a a series of skill tables with examples of tasks and behaviours. NOTE: This is not a straight-forward alignment, but rather an intersection that reflects the complex and multi-dimensional relationship between two very different underlying scales. 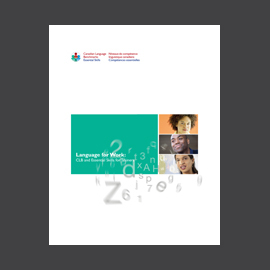 Canadian Language Benchmarks levels define learner performance whereas with Essential Skills, complexity levels are based on the task itself. It is not enough to simply consult the alignment tables in the framework in order to make assumptions about ES materials for specific purposes. It reflects an estimate of how both standards/ scales intersect. This section contains links to online materials and resources you might find useful in your teaching, curriculum planning, and research activities. Many of them relate to either CLB or Essential Skills directly, but many also link to sites with resources to help with pre-employment and workplace related content.